The WOW Factor & Million $ View Unique Oversized Ledges Point Condo!!! You have discovered the nicest condominium available in the popular Ledges Complex at the Lake of the Ozarks. 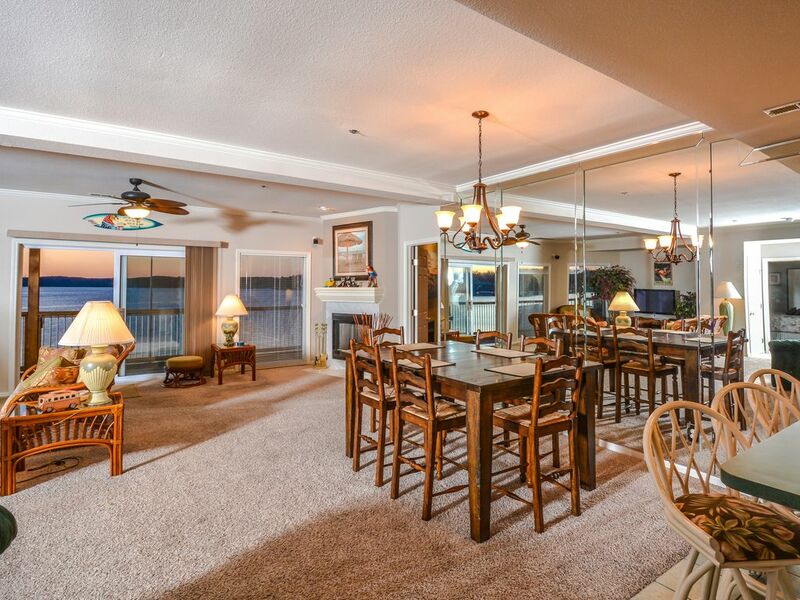 This is a RARE 3 Bedroom 2 Bath unit located on the tip of the point of the complex at the water's edge! This spectacular condo offers nearly 1900 square feet of space inside and a 100 foot wrap-around deck outside overlooking the Pool with an outstanding view of the Lake's main channel! There are many great things to list about the condo. Please, first scroll all the way down to see the pictures that are worth a thousand words... Rest-assured that your family and friends will be staying in a very clean, very well-appointed condo featuring many luxury amenities. The Decor' and Furnishings are all very nice and Comfortable! The entertainment system is top-notch featuring a large flat panel HDTV and a Bose home theater sound system. Bring along your laptop and log onto the INTERNET at High-Speed! BOATERS: Our 14 x 40 foot cruiser slip is close by and available upon request. The State Park is just a short drive away and offers very nice ramping facilities as well as short to long-term trailer parking for your Boat or Personal Watercraft Trailer. By water, you'll be on the 20.5 Mile Marker which is just around the corner from the Grand Glaize Bridge! LADIES' WEEKENDS: All the shopping at the Lake is close by! The Lake of the Ozarks hosts the Factory Outlet Village, the largest Outlet Mall in the State with over 110 factory direct outlets. These stores are jam-packed with famous name brand merchandise at prices that will amaze even the most experienced bargain hunters...25-70% savings. Ask me about special coupons! GOLFERS: You've surely heard of the awesome courses the Lake area boasts!!! All of them are a short drive from the centrally located Ledges Complex. Bring those Clubs!!! Hello, My name is Jason Boschert and I'm pleased to be the Property Manager for this Incredible Condominium at the Popular Ledges Complex in Osage Beach. Please feel free to contact me with all of your questions, for any needs during your stay, and if you'd like any recommendations for things to do while visiting the Lake of the Ozarks. As the property manager, I'm working for you as well as the property owner! My goal is to provide a relaxing, worry-free getaway with upscale amenities to accommodate our guests. The Lake of the Ozarks is an area we've always enjoyed vacationing. Once we were in a position to purchase a vacation home, this was our first choice! There's been so much growth at the Lake in recent years that all the comforts of home are right here - when you're 'away from it all' at the lake, everything you need is still close by which makes it that much more relaxing to take a break! The Ledges is a conveniently located, popular complex in the Heart of Osage Beach. The Ledges offers the hard to find combination of outstanding main-channel views and the serenity of a peaceful no-wake cove. The complex offers two pools, one of which is just beneath the condo on the point of the property with a great view of the Lake - also a great location to enjoy the sunset. In addition, there is a sandy beach play and swim area that the kids really enjoy! It' doesn't get any better than this! Miles of the Lake visible from almost every room in the condo. A top-notch Tennis facility is located about 15 minutes from the condo and open to the public. The unit was very nice and spcious, there were a few items that looked like they had been broken by previous guest but overall a very nice place to stay. We stayed here a couple of weekends ago for 2 nights. The view was amazing! The sunset on the deck was breathtaking. We loved the bunk bed room for the kids. Having the pool directly below the deck was a bonus because we could communicate with other members of our party easily. We rented a boat for a day from a location in the same cove which was super convenient. We would definitely stay here again! This is an excellent place to stay! Was clean upon arrival. Had good space for 4 adults and 5 children. The view from the deck was great all day, but the sunset was absolutely beautiful!! Pool was a little chilly but no complaints about the condo. Will definitely stay here again! Property was great and location was excellent , close to everything we needed in 10- 15 mins . Nice place, needs a little updating , living room furniture for sure . But overall very good. Spacious deck was wonderful and close to pool so kids loved it . We enjoyed the view every night . The grounds are well kept and maintenance people are awesome folks . I would give 4 1/2 stars . The condo was perfect for us! We loved this condo. Clean, well stocked, and just what we needed. All the comforts of home. Loved the view from our deck. My elderly mom who stays out of the sun, was able to watch our crew splash around in the pool, from the deck above, and that made her happy. The boat rental place was just around the corner, and we were able to pick everyone up right at the complex. It was a short drive to town. Nice place. Would stay here again. The Ledges is a conveniently located, popular complex in the Heart of Osage Beach. The Ledges offers the hard to find combination of outstanding main-channel views and the serenity of a peaceful no-wake cove. When you're 'away' at our condos, you are still close to everything you need including restaurants, shopping, grocery stores, and entertainment. The Outlet Mall in Osage Beach is just 6 miles from the condo. Other attractions include the Osage Beach State Park at 2 miles away and the Ha Ha Tonka State Park at 16 miles away.